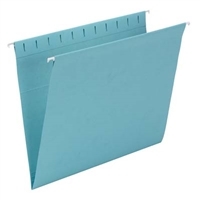 The popular choice for desk drawer files, hanging folders keep papers neatly vertical in the file. Coated rod tips slide easily on the file drawers. Clear poly tabs can be positioned in several locations on front or back panel. Choose from 17 bight colors to code different types of files and complement your office decor. Use with colored interior folders to prevent misfiling.